Have you ever had a dream that wouldn’t go away? Something you could see so clearly that it was almost…but not quite…real? I saw a quote recently that said something like a goal without action is just a dream. So I decided to take action on a dream I’ve had for about 16 years. When we moved to the lake all those years ago, I knew this would be the perfect spot for a labyrinth but it was always just talk. I could see it in my head but that’s where it stayed. I drew pictures and plans, read books and walked every labyrinth I found always with thinking “Someday”. Until last week, when I stopped talking and got to work. I finally admitted that the only reason I didn’t have a labyrinth yet was because I hadn’t done the work. Duh. So I drew up my final plan, roughing out how I wanted to approach it. Then I recruited help from my patient husband and rolled up my sleeves. There were a couple of hiccups and false starts. We even had it almost finished at one point with just one more circuit to lay out when we realised it wasn’t going to fit. We had a choice. Reduce it to a 5-circuit labyrinth or shift everything and stick to the original plan. I was almost ready to just ‘settle’ but I’d waited to long for my vision to be reality. We took up all the markers and started over. It was hard work. More than I expected it to be. I guess I’ve been sitting behind my computer a little too much because I was stiff for 2 days after. All that bending! But it was worth every stretched, aching muscle because my dream is now reality. I’ve walked it a number of times now as a meditation tool or simply to take time to think through some questions. Even my husband said he felt the peace of the labyrinth and he tends to be a very black and white kind of guy. We start and end facing out over the water, just as I envisioned it. The outer circuit includes a wooded path at the side of our yard. We placed a bench in the middle so we could stop and be in the moment before winding our way back out. While I still want old bricks to embed in the grass to create permanent ‘walls’, it’s perfect just as it is. It’s not often when a reality reflects the vision I held but this time it does. 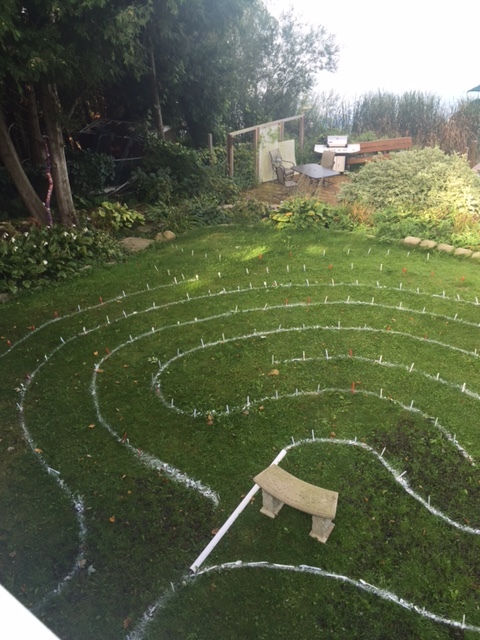 Here’s what I learned building my labyrinth. First: My passions and dreams aren’t just random quirks of my brain or a result of what I ate this morning. They were given to me for a reason. There’s something for me to get up to in the world. Second: Until I take action, no one benefits from those passions and dreams, including myself. Going forward, I will let these two lessons guide me. I don’t want to leave this world without at least trying. I don’t want my dreams to stay stuck in my head. My ‘job’ is to show up and do the work. To ask for help when needed and to be willing to start over rather than settle for less than what I want. What about you? Is there something you’ve been dreaming about for way too long? What’s one step you can take today to make it real?